On the Friday NI Rocks Show on 6th June we had an interview with Richie Sambora ahead of his show in the Ulster Hall on 1st July. (http://www.rockradioni.co.uk/interviews/1560-rock-radio-ni-interview-with-richie-sambora.html ) As I’ve been a fan of his touring partner Orianthi for some time it was a great privilege to record an interview with her just before she went on stage in Belfast. We believe this may have been the only interview whilst in Belfast and Rock Radio NI are delighted to have managed to get interviews with both Richie and Orianthi who have been touring together for a few months and are currently working on a new album together. We talked about the tour, writing and recording the new material, being involved in the Alice Cooper Band, Twitter and future plans amongst other things. NI ROCKS – Ori thanks very much for taking some time to talk to Rock Radio NI. You’re about to play The Ulster Hall in Belfast. Apparently the first place that Led Zeppelin played “Stairway To Heaven”. ORIANTHI Yeah, that is awesome. NI ROCKS – Do you get much time to take places in as you’re on tour or is it literally in and out? Did you get to see much of Belfast? ORIANTHI – Tomorrow we have a day off and we’re going to have a look around. And I’m going to enjoy doing that because the weather outside is beautiful and the architecture is really impressive. It’s always great to have a day off and go walk-about. NI ROCKS – You’ve been on tour now with Richie for a few months, how did you feel stepping in to play Bon Jovi Tracks in front of what can be a fiercely loyal fan base. ORIANTHI – Yeah, I’m just doing my thing you know. I always just do that. You know I used to play Bon Jovi songs when I was in a covers band. It’s just great to get up there with an amazing musician, singer and performer like Richie. He does he own versions that are completely different from what it was like. He takes on a new life - he's more blues based. He just sings and plays his arse off every night. It’s awesome to be up there and inspiring because I’m up there because he’s on fire. When you watch like Stevie Ray get up live at El Mocambo and he plays and he’s got that fire. We could jam until the cows come home. NI ROCKS – There’s lot of videos of you both now on YouTube and you just seem to be having so much fun with it all. ORIANTHI – Yeah, definitely. I think there’s like a 12 or 13 minute version of Voodoo Child. We could just jam for about 30 minutes. It’s just so much fun. That’s what is missing in music these days, that freedom. I grew up listening to Jimi Hendrix, Stevie Ray Vaughan and Carlos Santana and watching Woodstock. Watching those festivals where you didn’t have time to play 20 songs, everything like Stairway to Heaven went on forever, so orchestrators got big guitar parts soloed and everything. It’s more interesting. Music should get back to that. NI ROCKS – We spoke to Richie on the radio a few weeks ago about the music you were writing together. He referred to it as “Fleetwood Mac on steroids”. Do you think that sums it up? ORIANTHI – Yeah. I think Stevie Nicks is amazing, the harmonies and everything. And also a lot of songs I’ll be singing and a lot Richie will be singing and I’ll be backing him up singing harmonies and playing guitar. It’s got that kinda vibe to it, it really does. We have acoustic tracks and then others that are a bit Hendrix, kind of commercial and there’s a bit of country there too. It’s not too out of the box though. We’ve written thirty plus songs and they all go together. They don’t all sound the same, but they’ve got this thread to them. The dynamic between his playing and singing and mine, it’s just got this real soul to it that I really dig. NI ROCKS – How do you find writing with Richie compared to writing your own stuff or writing with others you’ve worked with? ORIANTHI – I love writing with him. He’s very much about the lyric. We’ll come up with a title or something in a conversation and jot it down – my phones full of them and there are all these pads lying around the place. Then someone will come up with a riff and we’ll have that title and start writing a song. We’re really digging deep to get the right lyric, for it to be something that we are both really proud of, not just a throw away. Sometimes you write with people, and I’ve been on those writing trips where you write with a bunch of people and they don’t focus too much on it being personal. All the songs are really personal to us. NI ROCKS – Any rough idea yet of a release date for the album? ORIANTHI – I think by January 1st. We want something out by then. NI ROCKS – You were in the Alice Cooper Band for almost three years. I’ve interviewed both Ryan Roxie and Chuck Garric over the past year and both rate Alice as one of the best people to work with. What were your experiences over those three years working with Alice? ORIANTHI – Alice is amazing and is one of the nicest people you will ever meet. He’s an incredible performer and I’ve learnt so much from him. They’re like family to me and forever will be. He’s like my dad out on tour, he really was and the guys in the band are like my brothers. Being the only girl, coming into a situation like that and learning all these songs is another thing. And they’re not like straight forward rock songs. You learn. And there’s a lot of theatrics going on and I loved it. Like celebrating Halloween every night. Then you learn how orchestrated the songs are and all the different guitar parts. I think he says that all the guitarists that he was working with were all on different drugs at the same time and then the producer pulls them in. All these talents, very much Frank Zappa almost, and then it’s got that real old school classic rock feel to it. It’s out of the box, completely. I loved it. Covering myself in blood, having the best time with it all. A great, great guy for sure. NI ROCKS – You announced obviously that you wouldn’t be joining Alice on his current tour as you’re here with Richie. Will that be a permanent break? 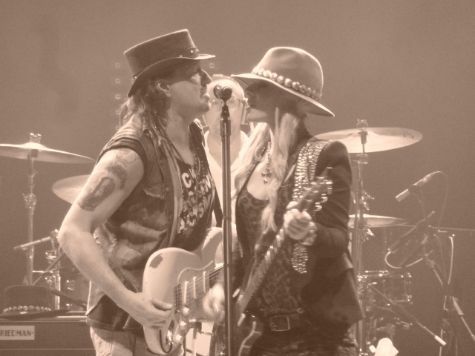 ORIANTHI – I’ve been writing with Richie and making a record. We’re not out on the road for three or four months solid, we’re doing sporadic shows and going back to the studio. So I told Alice that I really needed to take this time to do another record. It just felt like the right time for me artistically to do that. It just wouldn’t work doing sporadic shows with Alice, it didn’t make sense. I so made the decision to do this record. But as I said I love them all. NI ROCKS – You’re not ruling out going back again. Would you go back again? ORIANTHI – Oh definitely yeah. I’ll always love Alice. Anytime Alice calls me up to come do a show with him, or whatever he wants me to do, I’m there. He is one of those people that you don’t meet very many of. I got to work with Michael Jackson and he had the same dedication to his art. He was very much about the show and being the way that he looked. He was a performer and that is the way Alice is. He very infectious and when he gets up on stage he doesn’t break character. He’s pretty amazing at what he does. NI ROCKS – You’re not even 30 yet and you’ve worked with some of the biggest names in the business already. Is it possible to pick out a highlight from that career? You started off early and played on stage with Stevie Vai and Carlos Santana. ORIANTHI – I’ve been very blessed. All these people I’ve got to work with that I used to play their songs in a covers band. I quit school at 15, played until I was 21. Santana is the reason I played guitar and he’s a friend and to be able to call him that! Wow. The last thing I did for Carlos was to play at the Kennedy honours which was in front of Obama, Santana and Billy Joel. Playing his solos with Steve Winwood and Sheila E. I mean seriously, I had to hit myself afterwards thinking was that real life. For real! You pick up a guitar, that’s my idol and he inspired me so much. I was chosen. They asked me to come and play the solo. It was really really weird. I never take any of that stuff for granted. It doesn’t sink in for a while. NI ROCKS – Is there someone you haven’t worked with who would be on your “bucket list” so to speak? ORIANTHI – There are so many new artists that come out and you hear and think bloody hell that voice is great. I’m a big fan of the Kings of Leon. I cover “Use Somebody” a lot. I love that song and I’d like to work with them and do something. I’m a big country fan and there are so many different artists that if they called me up and said do want to do a solo for me, or appear on a record I’d say yeah. Who else is there? I think Ed Sheeran is really great. Pharrell Williams, I just heard his new song. Kanye West and Jay-Z. I’m a big rap fan as well. NI ROCKS – You’re very active on Twitter and Instagram and have a huge on-line following. NI ROCKS – Yes, you are! Big time. Is that something you try to find time for everyday or does it just come naturally to be tweeting? ORIANTHI – I think it’s more like an addiction. I can’t bite my nails now unfortunately. The good thing about Twitter is that it’s immediate and connects you to your fans. I’ve got so much support from Twitter and Facebook and it only takes a few seconds to respond. I try to do as many as I can every day or I read them all. If there’s no wi-fi connection or I’m stuck in a rural area driving past cows. After shows you get on a bus, sit around, eat and I’m tweeting! NI ROCKS – Finally, for all the guitarists out there. Can you tell us what guitars you’re using on the current tour? ORIANTHI – I’m using a Santana PRS. I love that. It gives incredible tone. I’m using a Manos which is a PRS that I’ve had for about ten years - a custom 22 and I’m also using a Gibson J100. I’ve just got that, it’s really cool. And I’m also using another PRS, the custom 24. They’re completely different guitars than what I use with Alice Cooper. They’re all set with Floyd Rose Tremelo and everything and are all covered in blood (laughs). NI ROCKS – That’s all the questions that I have for you, I didn’t want to keep you too long. Thanks very much for talking to us. Good luck with the show and I hope you enjoy your day off in Belfast.